REFLECTION: Until we meet again…. Last night was our regular weekly session for Fr. Al`s Theology of the Body workshop. Although I did not receive prior notice about it, I was able to attend Inga`s prayer vigil. I was already so engrossed and awed by what Fr. Al was teaching but somehow the music in the sanctuary seemed to grow louder and louder by the minute until I snuck out and joined the rest. It was as if Inga knew I would be crushed if I missed the vigil and she wanted to make sure I was there. I am so glad I was. God is so…good! Before he started the service, Msgr. Greg Smith mentioned that because Inga was so special to so many, he had chosen to perform some ceremonies which normally would take place at the back up front so we would all be able to experience them together with him. He laid on a beautiful white cloth over Inga`s caskette and he then sprinkled Holy Water over it. Together with the long, lighted Baptismal candle, they each symbolized Inga`s return to the Church where she was first baptized into the Father`s family. After the readings, Msgr. mentioned that the original plan was to pray a decade of the Rosary for Inga, but when he consulted Chris, Inga’s loving husband, Chris mentioned that Inga would have been annoyed if it was left as such. Instead, Inga’s love for the Rosary led us to pray the entire Rosary for her and the many other deceased souls. Before he gave his homily at Inga’s Requiem Mass this morning, Msgr. mentioned that he told Chris he was uncertain as to how he would be able to give the homily without breaking down. To that, Chris mentioned that Lauren, their youngest daughter, had told him that “When you feel like that, just take a deep breath.” Msgr. added that he would have to embrace that advice this morning. Msgr. Greg was on a writing `holiday` when Inga turned for the worse. He mentioned that in a sense, it was a blessing for our new assistant Pastor since it gave him an opportunity to witness and experience the profound faith, hope and love Inga had for God. As Fr. Xavier ministered to Inga, she ministered to him. When he received the news of Inga’s passing, Msgr. was engaged in his replies to 2 piles of Christmas cards that laid before him. On top of the second pile was Kristen`s (their oldest daughter`s) artistically hand drawn card of Mother Mary with Inga`s brief note, thanking him for his pastoral care during her illness during the Christmas season. She added that the peace of Christ was in each of their hearts. That, Msgr said, was Inga`s euglogy for herself. Msgr. mentioned that it is a tough task to understand God’s power. If He is all powerful and great, why didn’t He heal Inga? Msgr stressed that God’s power that He exerted on Inga was the very same power that He exerted when He raised Jesus from the dead. That was God’s great, supreme power that sustained Inga…. (pause) DEEP BREATH… and it will sustain you and each and everyone of us. Msgr. ended his homily. To my friend Inga…until we meet again. REFLECTION: Will you take his hand? It is said that a picture paints a thousand words. Is this picture, then, saying anything to you? Would you care to examine it more carefully and see what you “hear”? To me, the relaxed hand on the left appears to be youthful and prestine while the extended one on the right appears to be more “toned” through use. As I examine both hands more carefully, I notice that the hand on the left is relaxed and appears “indifferent” while the right one is outstretched and the index finger is extended as if it is reaching out, in hopes of touching the finger of the other. Would you care to step back with me and view this picture in its entirety? This is Michael Angelo’s painting of the Creation of Adam which can be found in the Sistene Chapel in Rome. Not being an avid art follower, I would never have guessed this was a depiction of creation if the title was not disclosed. As he began his Theology of the Body workshop. Fr. Al commented on this picture which is imprinted on the cover of Pope John Paul II’s book. He mentioned that the painting depicts God reaching out to Adam. Fr. Al described it as “God fully stretched out towards Adam, while Eve is tucked under His other arm, waiting to be created. 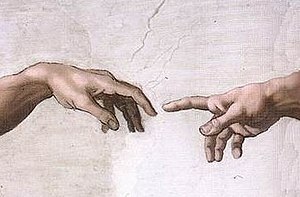 He then drew our attention to Adam’s partially lifted index finger which represents Adam’s free will.” The key question, he mentions is… How close do you want to draw to God? As I continue to study the painting, I notice that it is God who is fervently bent forward with a distinct attempt to touch man. “Man”, on the other hand, appears to be depicted sitting leisurely, casually extending his arm with a hand hanging over and fingers not necessarily reaching back out to God. Studying the fingers more carefully, there is a possiblity that his index finger may eventually point towards God, but there is a definite “voice” of indifference “spoken” by Adam’s posture and his facial expression. Come to think of it, isn’t this generally man’s attitude towards God? As I researched further, I came across http://en.wikipedia.org/wiki/The_Creation_of_Adam . It is apparent that what I see is totally different from what the scholars see in Michael Angelo’s painting. Hence, it becomes quite obvious why I am not an artistic scholar… I seem to “see” things differently from many others. And yet I know I am not mistaken when I say that man is generally indifferent towards God. Prior to experiencing God actively in my life, I probably felt the same. I don’t consider myself distinct from any other and I don’t believe I stood out for God to zero in on me as I mingled among many others. But the key issue here is that He found me and not, I Him. I don’t exactly know when it happened, but one day, as God reached out one more time to touch me, I reached back and took His hand and I’ve never let go. May the Father grant the grace for ALL eyes to “see” and recognize His extended hand and may each willingly choose to reach back and take His. REFLECTION in the Garden: To everything there is a season….. I believe many of the baby boomers and those born before them will recognize these verses from a song called “Turn! Turn! Turn!”. Wikepedia explains that this song is “adapted entirefly from the Book of Ecclesiastes in the Bible (with the exception of the last line) and put to music by Pete Seeger in 1959. (http://en.wikipedia.org/wiki/Turn!_Turn!_Turn!) In fact, this particular translation is from Ecclesiastes 3:3 of The Webster’s Bible. I had a few moments in the garden this morning and I managed to clear off wilted leaves and debris which fell or were blown into the flower beds during the cold winter season. Winter is still here, but the weather has warmed up enough for an “almost” avid gardener to work outdoors for a while. As I plucked off overlooked dried stalks and picked up the leaves and other debris, I began to notice the tips of new shoots from the flower bulbs which have pushed their way through the surface of the soil. I ignored those new growth for the longest while until I happened to use a bulb planter to “dig” up a dandelion weed together with these “bulb-lings”. My main intent was to remove the dandelion weed, roots and all, but the simultaneous extraction of the “bulb-lings” brought forth “new light”. I brought these little “babies” to the front yard and I decided to plant them in the clump they came up in! That was when I sensed the Father saying this is what our community has to do now. Many of you already know that my friend, Inga Redasovic, had passed away last Thursday evening. Her funeral Mass will be celebrated this Friday and because she was one of the well known moms at St. Anthony’s Elementary School, several of us who are part of the Catholic Women’s League were asked to assist with the reception. I had graciously declined my assistance, knowing that I would still be struggling with my sentiments over her loss. Nevertheless, this morning, I sensed the Father prompting me on. I sensed Him saying not to dwell in my sorrows any longer as I would have done had I left the dried up leaves and debris on the flower beds, but to move on beyond the sorrow and to rejoice that roots of death (the dandelion) has been uprooted and destroyed and Inga (the new shoots from the flower bulbs) have now been transplanted to a new place right in HIS heart. REFLECTION: How old was he again? 5So all the days that Adam lived were nine hundred and thirty years (930), and he died. So all the days of Seth were nine hundred and twelve years (912), and he died. 11 So all the days of Enosh were nine hundred and five years (905), and he died. 14 So all the days of Kenan were nine hundred and ten years (910), and he died. 17 So all the days of Mahalalel were eight hundred and ninety-five years (895), and he died. 20 So all the days of Jared were nine hundred and sixty-two years (962), and he died. and daughters. 23So all the days of Enoch were three hundred and sixty-five years (365). 24 Enoch walked with God; and he was not, for God took him. 27 So all the days of Methuselah were nine hundred and sixty-nine years (969), and he died. 31 So all the days of Lamech were seven hundred and seventy-seven years (777), and he died. 28 Noah lived three hundred and fifty years (350) after the flood. 29 So all the days of Noah were nine hundred and fifty years, and he died. The oldest man whose age was recorded in the Old Testament was Methuselah and he lived for nine hundred and sixty nine years. YES, that’s right! You read it correctly, that was 969 YEARS! And to think, no one even had a chance to eat from the Tree of Life! Did you notice anything else? I did. Each of these men died, except for one, Enoch. Unlike the others, “he was not, for the Lord took him.” I wondered why, and when I examined the geneology again, I noticed that it also said that “Enoch walked with God three hundred years (300) after he became the father of Methuselah” and “he was not” when he was 365 years old. Are you beginning to see what I see? It appears as if those who walked with God died a lot earlier than those who didn’t. I pondered over this for a while. Considering the extensive length of time the other men lived, to me, dying earlier at 300 years would have been a blessing as opposed to dying much later. I have no idea what these men were like in the 900th year, but if they were listless and their bodies were so worn out by then, wouldn’t any one prefer to die at an earlier age? Thoughts of Simeon in Luke 2:26-29 now come to mind. ” And it had been revealed to him (Simeon) by the Holy Spirit that he should not see death before he had seen the Lord’s Christ… Lord, now let your servant depart in peace, according to your word; for my eyes have seen your salvation which you have prepared in the presence of all peoples…” Through these verses we clearly see one, Simeon, asking God to finally let him die in peace since he had fulfilled God’s call. Msgr. Jensen gave a sermon several years ago where he mentioned that death was a gift God had given man AFTER the original fall. He had briefly explained that God didn’t want man to remain in a deteriorated, sinfull state perpetually. That was my first “aha” moment with regards to death and through the years, the concept has helped me accept and embrace the passing of loved ones. As I continue to reflect on it, I begin to see death as God’s way of providing mankind an escape from being trapped in deteriorated bodies forever. 1 Corinthians 10:13 says… ‘No temptation has overtaken you but such as is common to man; and God is faithful, who will not allow you to be tempted beyond what you are able, but with the temptation will provide the way of escape also, so that you will be able to endure it.” The word “escape” is something that needs to be examined more carefully. YourDictionary.com describes “escape” as…”to get free; get away; get out; break loose, as from a prison; to avoid an illness, accident, pain,…” The latter definition “to avoid an illness, accident, pain…” brings the thoughts of suicide and euthanasia to mind. In my opinion, I do NOT believe that either are what the Father has intended because the scripture ends with…”so that you will be able to endure it.” One would have to remain alive to be able to endure something. Ezekiel 18:32 says...”For I have no pleassure in death of anyone who dies,” declares the Lord God. “Therefore, repent and live.”‘. To me, both clearly indicate that God does NOT want anyone to experience perpetual death, but to repent (turn away from sin) and to live eternally in harmony with Him. Was it possible that God allowed the other men who refused to walk with Him to live as long as possible so that they would eventually come to repentance and live? In my eyes, it is apparent that the Father continues to use many at an older age, perhaps allowing these to linger on a little longer as they willingly share the wisdom they have acquired through their life journey. In truth, no one knows the exact day and time they will bid planet earth farewell. Nevertheless, I have come to realize that it is not the length of their life span that is relevant, but it is how one lives out his/her life. May the Father find ALL of us ready to return Home into His bossom when our time on earth is done. What did our pride avail us? What have wealth and its boastfulness afford us? Like a ship traversing the heaving water,of which, when it has passed, no trace can be found, no path of its keel in the waves. and cleft bythe rushing force Of speeding wings, is traversed: and afterward no mark of passage can be found in it. scattered by the wind, and like the passing memory of the nomad camping for a single day. shelter them with his right hand, and protect them with his arm. How do you let go when you don’t want to? With great difficulty…and with a heavy heart. Inga Radosevic passed away last night. We hardly met over the 5 years we’ve known each other and yet our spirits connected so deeply. The first time we “met” was over the phone when she called to thank me for the handmade card I made for her. A few days before our youngest left St. Anthony’s Elementary school, we had learned that a group of moms were making cards to deliver to a mom that was battling cancer. Meals were being prepared for the family and a card accompanied a meal each day. Our girls and I decided to help out. The cards made by our girls were much more beautiful than mine, but I believe it was the words on mine that found Inga’s soul and connected hers to mine. The inscription on my card came directly from Psalm 23 and I didn’t do anything more, but add Inga’s name to the prayer. “The Lord is Inga’s Shepherd, she shall not want. He makes her lie down in green pastures and he leads her beside quiet streams, He refreshes Inga’s soul. He guides her along the right paths for his name’s sake. Your rod and staff, they comfort her. You prepare a table before her in the presence of her enemies. You anoint her head with oil; her cup overflows. and she will dwell in the house of the Lord FOREVER! As I type this prayer out, my spirit is consoled. Inga was moved and touched by what the Father had taught me to claim for her and now, I, in turn, am moved and touched by the Father. He reminds me that even when she walked through the valley of death, Inga did NOT fear any evil for He was with her. Yesterday, her dear friend consoled me when she mentioned that Inga’s faith was strong while this morning, another mentioned that a few days earlier, Inga had reassured her dear husband that he could go on without her. With all my heart, I am reassured that Inga feared no evil. …”surely goodness and mercy will follow Inga all the days of her life…“. YES! Through those 5 extra years, as she continued to battle cancer, goodness and mercy followed Inga ALL of her days. Her faith continued to grow and she continued to lift many others up in her prayers as one prayer request after another landed on her computer screen. Inga was one of the Father’s faithful prayer warriors. And now as I join the rest of the world in bidding Inga farewell as she leaves planet earth and as she moves to Heaven into the bosom of the Father (footnote 1), I can now claim the grand finale of the prayer… Inga IS now dwelling in the house of the Lord FOREVER! Memories of my friend, Inga, continue to flow. As my thoughts continued to linger with her, I came across some correspondence from February 2008 which I believe many of you would be touched by. I have sorted the e-mail trail so that you can read the correspondence as a story. May the Father bring human “angels” across our paths and may we, in turn, be “angels” in other people’s lives. p.s. – I have included Fr. George’s e-mail correspondence as I believe the Father had also used him as part of the journey Inga and I had shared. Although the following topic (How God Uses Pain) is extremely heavy and it may perhaps turn some away, I would encourage all to read on. I assume many of you have realized I had not been well. Another bout of depression had visited over the last 7 months and my struggle, especially with my faith, was extremely agonizing. I knew God had something beautiful planned, but while I struggled with the horrid disease, I had extreme difficulty accepting that something good could come out of it. During the 7 months of anxiety and complete hopelessness, I continued knocking on God’s door…hoping and praying that He would ease the pain. It is so unfortunate that the symptoms of the horrid disease and the medication often masked the comfort of God’s love and presence. I often reminded myself of the pain and agony Jesus went through…in hope that I, in turn, would be able to carry on. I must confess I felt like a spoiled child, screaming and shouting, bargaining, pleading with God… I often tried to pretend to “live” the life of another person…but I soon realized that no one else had an easier life…not even Jesus. I am so grateful that while I couldn’t sense His presence, God sent others (His ministering human angels) to me. He also ensured that many of you continued to pray so that I could endure the journey…and I have! Thank you so much for your faithfulness! A few days ago I realized that women often forget the pain of childbirth. As Nancy (my best buddy) and I chatted, I realized that I cannot forget the pain/agony of depression. Perhaps the memory is not erased because it is a spiritual/emotional agonizing pain. Has God used this pain for good? My answer is an unwavering YES! During those months, I yearned and hungered for God’s comfort…for God’s presence. Now that I can “feel” again, I cannot describe the joy and peace of being given the privilege of basking in God’s love and presence. With all my heart, I encourage each of you to do the same. My prayer is that each of you take the opportunity to experience Him. Before I close, I would like to ask you all to pray especially for a young, grade 8 boy named Michael. Since December, he has succumbed to depression and he has not been able to return to school. Would you also pray for the many others in this world who are struggling with the same disease? I sense that I must share one more thing. I know many of you would not like to know how often I wanted to give up… since there didn’t seem to be any hope. Each time I wanted to give up, God reminded me of a lady named Inga who is battling with cancer. Inga and I have never met, but God somehow allowed our paths to meet indirectly (via the phone and e-mail) around June last year. I often told Inga that I didn’t understand why God had put her in a special place in my heart. Not too long ago, I began to understamd what God had done. About two months before the depression “visited”, God had placed Inga in my heart so I could lift her up in prayer. As I struggled during those seemingly endless months, God often reminded me to pray for Inga. As I prayed for her, I asked Him how she was able to endure. I knew He had given her that beautiful grace because I had overheard others say her faith has kept her going. I kept asking God to give me even a portion of her faith so I could continue on. I recently realized that God had used me in Inga’s life so that she (without her even realizing it until I told her) could later on help me to continue to choose life! Doesn’t God work amazingly???!!! Would you please pray along with me for Inga’s healing? As always…God is so….good! God bless! “I form the light and create darkness, I bring prosperity and create disaster; I, the LORD, do all these things” (Isa 45:7). God will use pain in order to create a love relationship with His creation. This statement may challenge your theology. However, consider that God allowed Jesus to experience incredible pain in order to create an opportunity to have a relationship with His creation. Consider how Jesus created a relationship with Paul. He blinded him and used a crisis in his life in order to bring him into a relationship with him and use him for God’s purposes. Consider how God recruited Jonah for the mission He had for him. This is not God’s first choice for His creation. Romans 2:4 reveals that God’s preference is to show mercy and kindness: “Or do you show contempt for the riches of His kindness, tolerance and patience, not realizing that God’s kindness leads you toward repentance?” The problem is there are few people who respond to the goodness of God. God loves people more than He loves their comfort. He invests a great deal into mankind. He desires relationship with us and will go to great lengths to create such a relationship in order for us to receive the rewards and inheritance He has for us. I have observed this process in the scriptures in working with people through years of ministry. I have noticed three distinct stages. First, we live based on convenience. Our obedience is largely based on circumstances in our lives. We choose to obey based on the circumstances. The second stage is the crisis stage. God allows a crisis to come into our lives. We are motivated to obey God in order to get out of the pain of our situation. Many times God allows us to stay in this condition in order to demonstrate His love and faithfulness during our pain. Gradually, we discover something knew about God and often have a personal encounter with Him that changes us. Our very nature is affected by this God-encounter. This begins to move us into a third phase that is a relationship that is motivated now by love and devotion instead of pain. This is where God desires us to be. Another way of saying this is we are no longer seeking His hand. We are seeking Him. We want to know God personally. Obedience will not last when the motivation is only the removal of our pain. Obedience only lasts when the motivation is loving devotion. Where are you in your obedience and what is the primary motivation? If it isn’t love, why not tell the Lord you love Him today and want to know Him for who He is and not for what He can do for you. I was so touched when I read your email from Feb 6th regarding how God uses pain. Thank you for expressing so beautifully how God has used us to support each other. What a priviledge to be of help, God does work amazingly! I credit your faithful prayers and those of my other Christian brothers and sisters with being able to live with cancer and having the strength to be a wife and mother despite this illness.Deepest thanks, Melissa, for your prayers for me. How kind of Fr. George to remember me and also pray. I will pray for Cindy Hogman and Michael (the boy with depression) and of course for you,that you continue experiencing God’s love and comfort. Thank you for sharing your story with me. Above all I thank God for making you well. I have been praying for you all along…I can do nothing else. Though I left Christ the Redeemer, I have been praying for Inga as well. Yes, we cannot understand God’s ways. But in the end, His providence comes through triumphant when we hang in with Him. It is the story of Job! REFLECTION: Who created the world? If you were asked, “Who created the world?”, what would your answer be? My answer was immediate and it was “God”. We were then asked again. “Who created the world? God the Father, God the Son or God the Holy Spirit?” My answer was immediate again and just as enthusiastic and I answered “God the Father!” and so did many others. Fr. Al said “No, it was God the Son.” I am not sure if he got a similar response when he taught Pope John Paul II’s Theology of the Body workshop to the Priests, but as he taught it to the laity, many of us were surprised and in shock. I forced myself to listen, but as he continued on, I quickly pulled out my Bible to read what was there. I skimmed through words that I had read and heard many a times and yet my mind held on to my answer…”God the Father”. During the break, I asked Fr. Al to show me where it said that it was Jesus who created the world and he pointed to the same verses I was reading. I now begin to see a parallel here. I don’t know who taught me that it was God the Father who created the world. I could have very readily presumed this on my own or had achieved this through “general” deduction. The reality is that God created the world. It shouldn’t really matter to me which person of the Trinity did it. God the Father, God the Son and God the Holy Spirit individually and combined is still my loving God, who has given me the beautiful grace to know Him so…personally and who has allowed me to finally see myself through His eyes and recognize that I can make a difference in this world. That is my God and He is the creator of this world. – the light of men is JESUS! Who do you say created the world? If anyone asked me again, I would continue to say God and I wouldn’t go further to expand on things. Nevertheless, I believe I am slowly coming to terms that Jesus the Son, who is still God, was the “person” in the trinity that created the world. REFLECTION: Tradition, laws, or are they just habits that are imitated without understanding? After the Gospel reading of Mark 3: 1-6 this morning, Fr. Xavier told the children a story about a non-Christian Indian priest and his cat. The priest was required to perform daily rituals and as he did, his cat always got in the way. Eventually, the priest decided to tie his cat outside before he entered the hut to perform his duties. This was repeated on a daily basis and eventually, when the priest died, one of his apostles took over and he continued to tie the cat each day. When the cat eventually died, the apostle bought another cat and tied it outside each morning. We chuckle at that and yet Fr. Xavier mentioned that at times, we carry on with traditions, laws or habits without pondering more deeply as to why these actions are taken. ” Why Does Jesus Heal on the Sabbath? I continue to ponder over this. Rules and regulations are set to provide peace and order and yet during emergencies, some rules need to be broken. Memories of a long traffic jam at the upper levels during a car accident come to mind. As I checked my rear view mirror, I noticed that the cars on each lane were moving away from each other to give way for an emergency vehicle that was attempting to drive through at the centre. As I followed suit, I noticed a lady immediately cut her way ahead of others, placing herself in the path of the upcoming emergency vehicle and blocking it’s path until others were able to move further aside to allow her to make room for the other. I wondered if I was the only one who was livid at this time, as this woman took advantage of the situation to get herself ahead of others. I prayed that this selfish act did not waste precious moments and there was no one up ahead who needed immediate medical attention. As I read the scripture again, I study the layout of the scene. This is what I see… Jesus walks in and sees a man with a shrivelled hand. The Pharisees, strutting around proudly in their grand attire, are already muttering to each other, perhaps making bets between themselves to see if Jesus would perform a miracle on the Sabbath. Jesus, being God, knows exactly what each is thinking. Nevertheless, even those around know what the Pharisees are thinking because their mannerism and actions speak voluminously of the malice that is in their hearts. Notice that the man doesn’t ask Jesus to heal his hand. Jesus sees beyond the shrivelled hand, as He looks into the man’s heart. I believe Jesus “met” the man’s spirit and He heard the silent cry asking to be healed. In my mind’s eye, Jesus is like the emergency vehicle that my memory has brought forth. Jesus is slowly moving forward to help those who may be injured. The Pharisees are like the woman who wanted to get ahead, blocking the emergency vehicle’s way, while she attempted to fulfill her selfish desires without considering the needs of others. Would you consider pondering over this for a while and search within to determine if there is any relevance there? Are we silently and blindly obeying society’s laws and regulations because this is what is socially acceptable or will we move forward as Jesus did, taking a chance to disobey social acceptance to bring forth right from wrong? What is going on in our world today? Are Christian rights being overlooked and trampled over to appease religious equality? May the Father give us the wisdom to see beyond what is on the surface and may He give us the courage and the strength to stand strong and move forward as Jesus did. REFLECTION: A deeper meaning of leprosy? As I listened to the Gospel reading from Luke 5: 12 – 16 this morning, the word “leprosy” hit me. Leprosy was a common disease that was repeatedly mentioned in the New Testament during Jesus’ public life. The reaction of others, basically fear and the desire to stay away from the leper is often discussed, but very little is said about the sentiments of the leper himself. As quickly as the short reading was read, other thoughts quickly bombarded my mind. I believe it was in Joni Erickson Tada’s book where I first learned that without treatment, the bacteria causing leprosy spreads further into the skin and the nervous system. It is when these extensive skin infection occurs that crippling and complete loss of sense of touch and pain in the hands and feet finally result . (http://www.fairmed.ch/fm/e/2_1_medizinisches.php) I believe those were the key words the Father wanted me to hold on to at the moment… complete loss of sense of touch and pain. The word desensitize now comes to mind and then the wise words of Andy (pseudo name), an elder gentleman I had joined a Bible study discussion group with last night, come to mind. Andy shared that if he was hit by a car when he was 30, he knew he would have immediately ridden an elevator down to hell. Now that he is in his 80s, he believes that if he died today, he knew his elevator ride would not be directly down, but lateral or upward. Interesting, isn’t it? Andy also shared that one of the greatest gifts God gives man that is unfortunately so destructive is “free will”. And then he added… “Today, everywhere I look, I see people that are very angry and the sad part is that they don’t even know why they are angry.” Some may have considered Andy’s comments chatty, but last night, Andy’s words spoke deeply to me. Although I was taking part in a group discussion, it appeared as if the Father and I were having a deeper side discussion as the Father used Andy’s life experiences as His living example. The “riches” that this young man had was his free will. Based on his previous comments, it appears as if Andy had exercised his free will loosely in his younger years, possibly choosing many ways that were not in line with what God would have liked. And yet, something happened along the way. One of the discussion questions asked if we recall experiencing the loving look of Jesus in our lives. I would like to think that that is what happened to Andy. Perhaps through the years of trials and adversity and of wisdom and discernment, Andy finally caught sight of Jesus’ loving glance and he found love. Someone commented on the possiblity that others may have used their money to buy love, but Andy replied that he could not perceive how anyone could buy love. Was he speaking from experience? I believe it was the loving glance of Jesus that Andy finally caught sight of that transformed his free will into His will. I believe God’s true, unconditional love transformed Andy. He commented that when one acquires riches, at times people don’t know what to do with the excess. As he mentioned that, my thoughts went to the “excess” freedom the Father has given each of us. What should we do with it? Should we save them and exercise them at a later time or should we offer them back to God and trust that His guidance alone would bring about more “wealth” than if we exercised our freedom on our own. Jesus’ question, Do you trust me?” also comes to mind. I began to sense that it is at the point when we have been given so much by God, that He asks if He could use us to touch others and, simulataneously, to carry our cross. I am surprised to hear that Andy recognizes the anger in many. Perhaps he knows the taste of anger and so he readily recognizes it in others? I also found it interesting that Andy commented that “many don’t even know what they are angry about.” I believe this is where the term leprosy comes in. As the disease progresses without treatment, “complete loss of touch and pain” is eventually experienced. Has a similar disease in society been left untreated and progressed to the point that man has become desensitized? The sense of touch and pain is crucial to the well being of every individual as the sense of pain signals that danger has been encountered. One would imagine that the moment pain on the foot or on the hand is felt, our brain would automatically cause us to withdraw that part of the body from the source of pain. However, when the loss of touch and pain come to play, the hand or foot is left, for example in the live fire, without the individual realizing that his body is in danger and massive damage is done. Likewise, when we become desensitized to the root causes of our anger and frustrations and we carry on without correcting the direction we are moving in, we become more prone to massive danger. May the Father open our spiritual eyes so that we may recognize when our spiritual lives are in danger and may He give us the desire to exercise our free will and ask Him to make us clean. P.S. – I don’t know Andy but I only know him by face. Nevertheless, it would be interesting if a common friend would share this reflection with him and ask if it has any significance or some resemblance to his life story. Since I first came across the sub-title “Concerning Self-Deception” in the book of Matthew during the Christmas holiday, the concept has remained with me. It has since continued to pop up every so often and I ask the Father why and if I have been deceiving myself. But why would one want to deceive oneself unless there is something that can’t be faced. Is there something that I am ashamed of and I need to run away from? I don’t think so, and yet why does the concept continue to arise? To me, the Sacrament of Confession is “beginning a renewed relationship with God”. It requires humbling oneself and admitting to the Father that you have sinned. In my experience, it takes a lot of humility and courage for one to go to confession in the presence of another. If the intent was to renew one’s relationship with God, why would one even consider lying about one’s sins? Why would one even consider going for the Sacrament of Confession if one intended to continue to do wrong? Is it really possible for some to truly consider using confession as a “laundromat”? Why?!? Perhaps I live such a sheltered life and my experiences prevent me from thinking as such. But is it really possible that some do? Romans 3:23 says…“For all have sinned and fall short of the glory of God.” It does NOT say some will sin or the rich will sin, but ALL. There is nothing that disqualifies any human being, other than Jesus, from committing sin. 1 John 1:19 says…”if we confess our sins, he is faithful and just and will forgive us our sins and purify us from all unrighteousness.” I believe this means that no matter how grave a sin we have committed, if and when we return to God and truly ask Him for forgiveness, He willingly forgives us. It looks like you are concerned that those who go to Confession aren’t truly sorry for their sins. The issue is not for us to deal with, but for God alone. Man can give lip service (say whatever he feels the Priest is wanting/ expecting him to say) so as to receive absolution, but God sees what is in the heart. We can never trick or bribe God. Proverbs 28:13 says…”He who conceals his sins does not prosper, but whoever confesses and renounces them finds mercy.” To renounce means …”to refuse to follow, obey, or recognize any further.” Man may think he/she is smarter than God and will manipulate God’s word to suite himself. Unfortunately, if he/she merely confesses his/her sin, but does not truly renounce (turn away from his old ways), God sees that. As hard as we try, we can never outsmart God. It is not up to us to make sure that another gives a good confession. I believe that is something that only God and the individual discerns. Each individual will be judged on the second coming of Jesus by every action which we have chosen to take or not take. God knows when a person is sincere and He knows when man tries to manipulate His rules to get by. Once again, the Father sees what is in the heart. The Father knows when one’s motive is not right and He will deal accordingly. “1) What is the role of the priest in identifying sinfulness? The priest cannot see your heart; he can give you feedback only on what you say. If you give false information, the priest can be misled in regard to your guilt. He may be able to help you to discern the sinfulness of an action by questioning you for clarification. What you consider as sin may not be sin at all and vice versa. So what the priest does is to help you to rectify your conscience. We need to distinguish sin as an objective reality and a subjective reality. Something may be objectively wrong and yet a person may honestly believe that it is right. That is why it is so important that individual consciences be rightly educated and formed. The priest helps the person in that education. Ultimately only God and the person concerned make a judgment. The priest’s job is to provide discernment in regard to sin and be the conduit of God’s forgiving mercy. 2) If venial sins are forgiven at the Mass, do we need to confess them again? Forgiven ‘venial sins’ need not be confessed again. But if we have a doubt, it is better to confess, especially if you are seeking a spiritual direction from the priest. He will get a better picture of you and then help you better. 3) Why doesn’t the priest give the same value to a sin which I feel as more burdensome? Perhaps this reflection is more for me than anyone else..but if it has led one to ponder a tad deeper, then perhaps it is for you too? Nevertheless, we come full circle back to self-deception. I am inclined to say that any form of deception, be it to deceive oneself or another, is not to anyone’s best interest. By definition, deceive means to mislead or to ensnare. Isn’t that what the devil, the father of lies, uses to destroy us? May the Father give us the grace to face our realities and come to terms with the consequences of our choices. May He open our spiritual eyes and may He allow us to see ourselves with His eyes and see our potential and the beauty within. Sirach 24:26 So if a man fasts for his sins, and goes again and does the same things, who will listen to his prayer? And what has he gained by humbling himself? You are currently browsing the In His Time blog archives for January, 2011.